You hear and read a little bit of everything about the engine oil change. 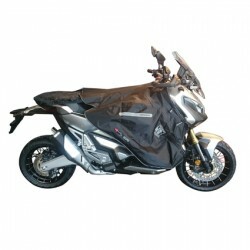 But since we are on a site dedicated to the X-ADV, both focus on its engine and its emptying needs. The new XADV 745cc Honda 7cc engine is from the NC750X, NC750S and Integra family. The peculiarity of this engine is that Honda recommends oil changes every 12,000 km or every year, whichever comes first. On the other hand, Honda recommends changing oil filters every 24,000 km. So much for the manufacturer's recommendations. Our recommendations differ a bit because we consider that all bikers are different and do not use their scooter in the same way. A city dweller who uses his 2 wheels all year long, every day to go to work does not have the same use as a haut-doubsien or a Savoyard who will have to store his X-ADV for several months in winter. . If your engine remains idle for several weeks, moisture in the engine will condense on the engine walls and oxidize it. During the restart, the oxidation will pass into the oil and degrade it. That is why we recommend to change the engine oil after each winter. The mileage is to be considered for someone who drives all year round. In this case, the emptying will mainly change the oil loaded particles related to engine wear and we can follow the recommendation of all 12,000 km of Honda. Only if you do a lot more than 12,000 km a year and you winter your X-ADV several weeks should really consider several changes a year. Regarding oil filters, we recommend changing them at each oil change if your budget allows. It is a matter of principle not to pass clean oil into a dirty filter. If your budget is a bit tight then change the filters one out every two. Over time, a brake fluid will charge in moisture. During long braking, the rise in temperature of the liquid will transform this moisture into gas. Since the gas is compressible (unlike liquid), operating the brake lever will first compress the gases before pushing the caliper pistons. Basically, you have this feeling of spongy leverage. It is considered better to change the brake fluid every 2 years. But it may be necessary to do it more often if your X-ADV is parked in a very wet garage. The coolant degrades with time and loses its cooling qualities. The main disadvantage of a poorly cooled engine is overconsumption. One could also imagine damaging the engine after overheating. The recommendation is to change the coolant every 3 years. As previously explained, the change of oil, brake fluid and cooling can be handled completely independently of the general maintenance of your X-ADV. Below you will find mileage-only operations. * HPI: Honda recommended inspection consists of checking: fuel lines, accelerator operation, idle speed, final drive shoe, pad wear, braking system, brake operation parking lot, headlight, side stand, suspensions, screws, nuts and fasteners, tires and bearings. Clean the suction lines of the crankcase oil vapors.